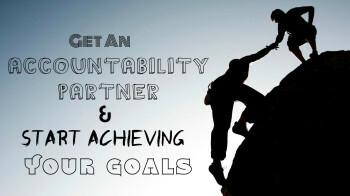 Do you know what an accountability partner is? Better yet, do you have one? A few weeks ago, an acquaintance of mine called and asked if I would be her accountability partner. I was absolutely thrilled. Not only do we have similar careers, I also admire and trust her implicitly. I knew that working with her would help me be a better professional speaker and a better person in the process. So here’s how it goes. Pick a goal that you would like to achieve. It could be related to physical fitness, improving your business, a personal project – actually, just about anything. 1. Find the Right Person: Choose a person who will be encouraging and motivating, yet will push you to get closer to your goal. Someone who will not accept your excuses, and will give you pointers on how to move forward. It will be helpful if your values and ideas are similar. Remember, this relationship is chosen – it should not feel forced or uncomfortable. 2. Take Responsibility for Your Goal: Remember that your accountability partner is not responsible for your successes or your setbacks. S/he will help to guide you, but you are the only one who is ultimately responsible for yourself. 3. Make Time: Schedule a specific time to meet or talk on the phone, and stick to it!!! Consistency is the key. My partner and I talk every Monday at 9:00am. If either one of us is traveling or has an appointment we can’t change, we reschedule, but that is rare. Research shows that we are more likely to achieve our goals if we have someone to be accountable to. I know this works for me. I still may procrastinate and have to set the alarm for 6:00 Monday morning to get ready for my accountability partner that day, but I do get it done. And the best part is that I love working with her. It’s fun and productive and supportive. What a great way to start my week!!! Try it and let me know if it works for you. Just remember to surround yourself with people that force you to do better. You can’t lose. I am laughing. If anyone makes you their accountability partner they better be dead serious about achieving their goals!!!! Thanks for the boost – it’s a good thing that people see me as being serious when it comes to accountability. The main thing is to figure out what goal you want to pursue, then go after it with a vengeance.